Andy Mills, Becky Osborn and Erica Neitz are all graduates of Kenyon College, where Shapesville was created as an independent study project under the supervision of Michael P. Levine, Ph.D. and Linda Smolak, Ph.D., both of whom are internationally-respected authorities on eating disorders prevention. 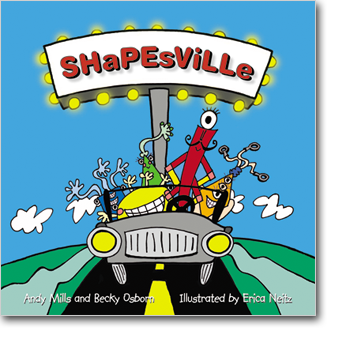 Shapesville is a small town where five friends of various shapes, sizes, colors, and talents celebrate what makes each of them unique. Simple, rhyming verse, bold, playful illustrations of basic shapes and colors, and endearing characters show that "It's not the size of your shape or the shape of your size, but the size of your heart that deserves first prize." Discussion questions and a note to parents and educators at the end of the book further its message of positive body image. "Invariably, after a presentation to elementary school teachers or parents of young children, someone asks 'How can I help the younger children begin to develop a positive body image?' Now I can enthusiastically and confidently hold up Shapesville. This small book is a big development in the field of preventive education." "Children will smile at the words and laugh aloud at the colorful, imaginative drawings-all while learning to be more accepting of themselves and others." "SO ADORABLE!!! Every parent and everyone in the field of eating disorders should order this book for every young child they know."